4 x 73GB Hard Disk Drives. DAT 72 Drive. Also includes rack rails fittings for easy rackmounting. 4 x 146GB 15K SAS Drives (not SSD). Photos demonstrate installation of Windows Server Ed 2012 R12 being installed. Unit has CPU's and x1 32gb DDR3 Ram fitted. HP Proliant DL G6 Server Windows 2008r2 Server. Condition is Used. 4GB HP RAM. Very Clean. Used in air conditioned room. A null-modem cable/adapter is required to connect to a PC. Takes up to 8 standard SATA drives. All caddies are present. A copy of the operation manual can be found at. Storage (SAS): 6x 146GB SAS 10K. Form Factor: 2U Rackmount. We can only apologize for this, and hope this does not cause you any problems. BER (Beyond Economical Repair). Okay Condition – Large Dents, Cracked Casing etc. SERVER ONLY - COMPLETE WITH 2 x XEON E5620 CPU @ 2.40GHz - 16GB RAM - NO HDD. 24GB from 12 x 2GB DDR3 1333MHz. 12 Core 24 Thread through dual X5650 Xeon CPUs. Drives wiped. No OS but Server 2008 COA present. iDRAC 6 Enterprise Card. WHAT'S INCLUDED: - Server ONLY. SHELF CODE: R12 24/4 17 GH. WHAT'SNOT INCLUDED: - Hard drives / Cables / Accessories / Software etc. SPECIFICATION: - See title for specification. OS is not installed. Dell Poweredge R620 ( Max Turbo 2.50 GHz ). 96GB DDR3 Installed ( call for upgrade ). DELL Poweredge Servers. Dell Poweredge 2850. Dell Poweredge 1950. Dell Poweredge 2900. Dell Poweredge 2950. Dell Poweredge R200. Dell PowerVault MD1220 2U 24 bay 2.5" SAS Storage Array 2 x contr. 1x Dell PowerVault MD1220 2U 24 bay 2.5" SAS Storage Array 2 x contr 2xP. However we may use our discretion also to provide the safest and best service. Model: HP ProLiant DL360p G8 - V2 CPU. HP ProLiant DL360p Gen8 E5-2600 V1/V2 CTO Rack Server. Heatsinks, processors, RAM, Hard drives, RAID Cards and Caddies are not included. Rack Servers. And if this isn't possible, or is unsuccessful, you have the right to receive a price reduction. Node Information. Server Information. Processor Type: Xeon Quad Core Server. Rackmount Rails Included: No. RAM: 24GB. Collection is possible, but not always convenient for us. If it is too big or delicate to send in a box, we may be able to send the goods on a pallet. WHAT'S INCLUDED: - Server ONLY. SHELF CODE: N26 2/4 21 GH. WHAT'SNOT INCLUDED: - Cables / Accessories / Software etc. SPECIFICATION: - See title for specification. OS is not installed. For sale is for a single HP DL380e Gen8 Server - 12 Bay LFF Chassis version - 12 x 3.5" Hard Drive Bays. 2 x E5-2420 6 Core CPU's (24 available Hyper threaded Cores). 2 x 146GB 10K Hot Swap SAS HDD. For sale is this high spec Dell Poweredge R710 Server. When IT managers learn one system, they have learned the logic required to manage Dell’s next generation servers. 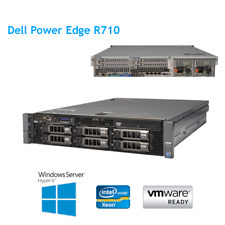 Dell PowerEdge R710 2xHexCore XEON X5675 3.06GHz 128GB RAM Perc H700 2x300GB 2.5" 10K Enterprise. Dell Poweredge R710. DELL Poweredge Servers. Dell Poweredge 1950. Dell Poweredge 2950. Dell Poweredge R410. Screen Type TFT. Panel Samsung 15" LCD Panel. Viewing Angle 140 ° (H) x 120 ° (V) (Typ.). Horizontal Synchronization 48 - 60 KHz (Typ.). Back Light 4 CCFTs. We include exactly what is shown in the photographs, nothing more and nothing less.